This past summer I had the opportunity to work with a wonderful lady who was ready to make her town-home a real home. Her one condition: give me happy! So I did. Her living room was rectangular and awkward with a fireplace sitting catty corner to the front door. As a result, her furniture was stretched out across the room with furniture backs being the first thing guests saw when they walked in. And although she had plenty of furniture to fill the room, there was actually too much furniture and it was all mismatched. The first step was to move out the unnecessary furniture and recover what was left with coordinating fabrics. 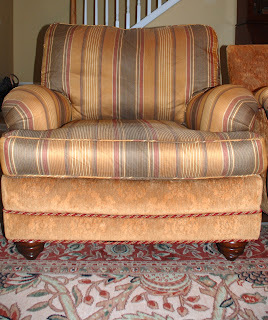 I chose a neutral linen for her chocolate velvet couch and put a brighter, happier stripe on her two stuffed chairs. Next, I divided the room. I used two-thirds of it as her living/television area and opened it up to guests by setting the furniture perpendicular to the front entry. I made the area by the fireplace into a reading area with a chair and ottoman, side table and a recovered formal chair. The second step was to replace the lighting. The ceiling fan was a standard builder fan with no charm. I replaced it with a fan that had palm fronds as the blades to give the room a tropical, warm vibe. Last, but not least, was new pillows! I chose fun, happy fabrics in lime green and coral to tie the room together for a more cohesive look and that was it! I was able to use my client's existing rug, accessories, pictures and furniture for the rest. How easy (and happy) was that?